On September 18, 2018 at approximately 6:00 AM, a woman accidentally left her wallet behind following a purchase at the self-checkout at Walmart, located at 2500 West Stone Drive in Kingsport. The woman contacted Walmart personnel who found surveillance video footage showing a female suspect picking up the wallet and leaving the store. Among several items in the stolen wallet was a credit card. That card was utilized during an attempted fraudulent transaction of $48.94 later that same morning at Walmart Neighborhood Market, located at 750 Lynn Garden Drive. The female suspect was in the company of another woman who is also considered a person of interest in this investigation. Both women are shown in the included photos. 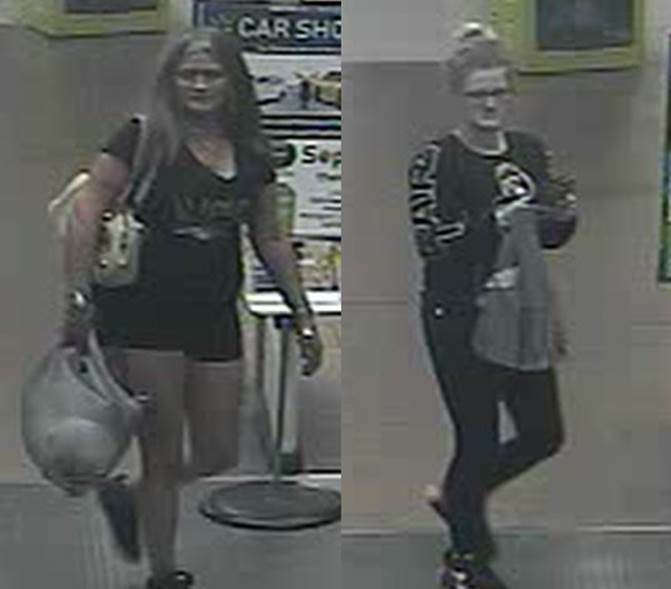 The suspect who stole the wallet is on the left, wearing shorts, and shown with her hair down. The person of interest who accompanied her is on the right, wearing long pants, and with her hair up. Anyone who recognizes either of these individuals is asked to contact Detectives in the K.P.D. Criminal Investigations Division at 423-229-9429 or call Kingsport Central Dispatch at 423-246-9111.